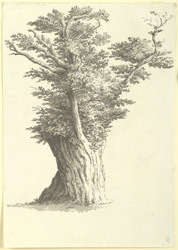 A view in ink of the ancient yew tree at The Old White Chapel in the North at Cleckheaton in Yorkshire. The chapel no longer exists. Langdale's Topographical Dictionary of Yorkshire (1822) notes that the old white chapel had recently been rebuilt and was now called the "White Chapel".